Asya in the Tilt of the World, or rather Asya, Christian and James, came in a dream. Specifically, I saw their first dance in the ballroom and the get-away in the limo, including the turning. I sometimes remember or stay with my dreams a while when first waking, but this one was especially vivid. I could see it, smell it, taste it, and the feelings they had toward each other I remember to this day. They stuck with me, and over time I found myself daydreaming about them, until they were fleshed out enough to put down on paper. Their adventures swept me a long at a pretty decent pace, I finished the first draft in six months. Then life kept happening, and five years later I pulled them back out of a dusty corner of my hard drive and workshopped the piece through my writing group. I’m a social worker by day, in the field of child protective services. That means that every day is filled with a lot of tough realities, from childhood abuse and neglect, the opiate epidemic, domestic violence and poverty. It’s meaningful work, but what brings me back to Asya is the romance and fantasy of it all. I love romance, it’s hopeful. I love watching love prevail and grab my characters’ attention, especially in inconvenient moments, for example, when there’s saving the world to do. Strong feelings have a way of doing that – simultaneously taking someone out of their world and rooting them to it. It’s like coming home and feeling disoriented, and I find it delicious. I love exploring relationships, there’s so much learning that comes from intimacy with others. I also like to think about bigger issues. What would it take to get people to want to do good in the world, and to act on it? What does it mean to have power, or to be granted the privilege of power? What is trust and friendship? What does it take to heal humanity, and does everyone deserve healing? Asya is caught totally unaware, and is utterly surprised when her life takes a turn into something so much larger than herself. She struggles with self-doubt, could it really be her that is meant to have an impact of the world? She can hardly believe it. I think this is place that many of us find ourselves in. We find ourselves in moments where we are placed on the crossroads. We have choices. Do I stand up against this injustice, or do I wait for someone (fill in the blank – smarter, tougher, richer) else to fix it? Some of us are so convinced of our own inability to effect change that we miss those moments of destiny. What I find fun about Asya, James and Christian is that they are all in. They are embracing their destiny, even if that means muddling through days of what feels like faking it until you make it. Their enrapture with each other only leads them to feeling more certain that it is, in fact, all true. They own it, and are committed to bringing the prophecy to fruition. They accept their feelings toward each other, and also accept their parts in trying to do something that has never been done before – heal humanity and the planet on which we all live, and bring true balance to our existence. That they have no idea how to do any of it, the relationship or the balancing, just makes them unabashedly alive. 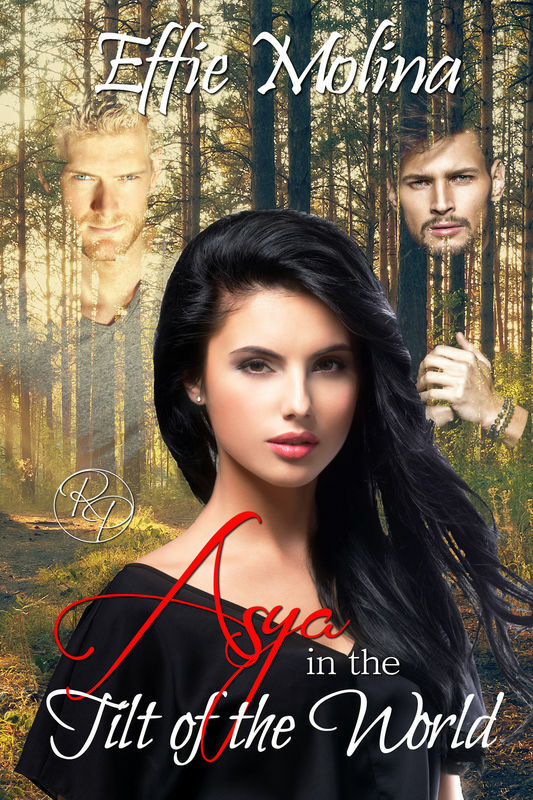 Asya, James and Christian, as well as the friends they pick up along the way, have a lot of figuring out to do, and it doesn’t all get done in the first book. I look forward to hanging with them all a bit longer as they find their way through the life set out before them. ​Effie Molina has words crowding her head and occasionally untangles them into stories. Effie is a multi-racial, bi-identified woman living in Western Massachusetts. Effie enjoys exploring the human condition, speaking truth to power and striving to be consistently authentic and brave. She does this best while home with the love of her life, surrounded by kids and beasts. While not writing, she’s supervising a team of child protective social workers by day and dancing in an Afro-Cuban performance group at night.